Our Espresso in Torino and Piemonte series takes us back to Alba, Italy for Golosi di Salute — a café that’s certainly known more for its edibles than anything you can drink here. But that doesn’t mean the espresso is a slouch. With employees decked out in white lab coats, you’ll think you stepped into a Cafe Madeleine. The front of the shop is filled with various sweets, pastries, and, later in the day, a selection of gelato. (Here they seem to treat the Italian gelato like the American martini: “none before noon, thank you”.) At the back is a rather regal seating room with a few tables and chairs. They swear by Filicori Zucchini‘s Club Kavé coffee, from Bologna, and they use a two-group La Spaziale S5/Caffè d’autore machine to produce an espresso with a light to medium brown crema of some thickness and a lighter density. Flavorwise, it exhibits soft tones of rounded, mild spices and some herbal notes. Served in Club Kavé-logo IPA cups, with an obligatory small glass of water on the side (nice touch), and — when served in the front — an insane selection of four different sugars to use: zucchero di mela, d’agave, d’uva, and d’acero (i.e., sugar made from apples, agave, grapes, and maple, respectively). A show and a shot for a mere €1. Read the review of Golosi di Salute. In a bizarre way, I have to give props to NPR today for airing a story on coffee tasters at Folgers, of all places: NPR : Meet the Woman Who Dictates the Taste of Coffee. NPR could have just as easily chosen to stereotypically interview the coffee taster at some sedated, eco-friendly company run by orphan bonobos and a CEO who hasn’t washed his hair nor worn pants since 1978 (see: PBS lifestyle coffee). But instead, they went for one of the Big 4: the unholy quartet of corporate coffee evil incarnate. The sweet smell of underwriting, perhaps?? Although I would never seek out coffee from a company that advertises their brand in association with New York sewer covers, the article does give the take of Folgers’ master roaster on the qualities evaluated and processes used when grading their coffee and standardizing their blends. Body, acidity, aroma, flavor…now where else have I seen these? Time for another smackdown between Folgers crystals and fancy restaurant coffee, like Lee’s Deli on Market St. near Montgomery St.
What’s amusing is the coffee indifference ABC 7’s “man in the street,” Terry McSweeney, receives from his interview subjects. After much debate, the idea of allowing commuters to bring their coffee on BART trains met with firm resistance: BART Staff Shoots Down Coffee Proposal – News Story – KTVU San Francisco. While we love coffee, we have to side with the many surveyed BART riders who voted against allowing beverages on trains. It’s bad enough that we’ve allowed the public to treat movie theaters like their living rooms; we don’t need to encourage people to treat public trains like the floor mats of their cars. (As if coffee in “to go” cups wasn’t enough of an atrocity to begin with.) Now who advocated this idea that we should be able to perform all bodily functions in all public places at all times? No matter what you might think of Arianna Huffington, you have to admire the cajones to publish today’s op-ed blog piece on The Huffington Post: Beverly Tan: Why I F**cking Hate Starbucks – Living on The Huffington Post. Author Beverly Tan, an admitted and yet reluctant Starbucks customer herself, rips into Starbucks’ super-saturated ubiquity, “cross between drain cleaner and flat Pepsi” quality, “lesbian folk singers and Miles Davis” soundtrack, and misplaced pretentiousness. Coincidentally, yesterday Starbucks announced that they are “upgrading” their espresso machines: Starbucks Upgrades Espresso Machines – WSJ.com. It’s a move designed to help stave off customer losses in their U.S. stores — though they’ll deny it’s connected in any way, just like their newly planned national ad campaign. Given the last time Starbucks put their genius towards “upgrading” espresso machines, where they replaced all their La Marzoccos with with superautomated Verismo machines, we can’t wait to see how they’re going to top that. Today’s Guardian (London) featured a humorous (or is that humourous?) piece on Nespresso and its lifestyle magazine: Nespresso isn’t just coffee … it’s an aspirational lifestyle marketing exercise by desperate lunatics | Food and drink | Life and Health. What’s not to like about the dry and wickedly clever British sense of humor? The author describes how purchasing a Nespresso machine required him to practically join a cult. All replacement coffee capsules for the device must be purchased through a “mysterious club,” and with it comes a lifestyle magazine “as hateful as Tatler, but with an overbearing and whorish emphasis on coffee pods bunged in for good measure.” Yes, photos of George Clooney accessorized with Nespresso capsules in the various rooms of his Lake Como mansion — to hopefully take some of the sting out of their exhorbitant prices. The aforementioned coffee-as-a-lifestyle marketing tactic is apparently alive and well. But for a device that so yearningly exhaults the necessary simplicity and convenience of home espresso making, its product marketing strangely turns it into one of the most complicated, life-altering decisions any consumer should reasonably bear. 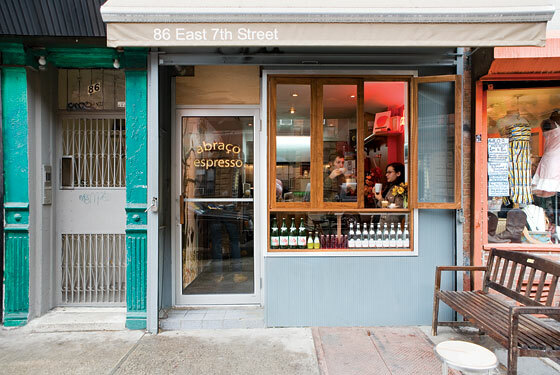 Yesterday’s New York magazine online reviewed the new East Village coffee bar named Abraço: Abraço — New York Magazine Restaurant Review. Just opened Oct. 17th of this year, one of its partners is also famously the former Blue Bottle Coffee Co. barista, Jamie McCormick. The review also oddly noted, “The thought of ranking coffee bars never crossed our minds. And for good reason: How do you review a coffee bar? Or rather, why would you?” With questions like that, is it any wonder why the general quality of NYC coffee is so inexcusably poor — and why (as indicated in a recent survey) New York ranked second only to Dallas/Ft. Worth for the lowest rate of coffee consumption among American cities? On one hand, Abraço should (hopefully) do extremely well given the general lack of alternatives. On the other hand, the phrase “like pearls before swine” does come to mind. (My coffee snobbery is clearly showing, but New York’s coffee standard is beyond any comprehension.) Hopefully Jamie and company will experience more of the former as part of the movement that’s starting to open the deadened eyes and taste buds of New York coffee drinkers. The New York Times “Dining Briefs” section picked up Abraço for a review: The New York Times > New York City Restaurant Reviews – NEW PLACES – Abraço Espresso. Surprisingly, they didn’t follow the usual habit of reviewing coffee bars as they would gas stations. They actually used adjectives when describing their coffee. Our Espresso in Torino and Piemonte series now turns to Bra, Italy. Bra carries a lot more influence than its 29,000 residents might suggest. For one, it is the unofficial capital of Piemonte’s Roero area — with a downtown that’s deceptively bustling for its size. Bra is also the world headquarters for Slow Food. Of 18 bars in all of Italy singled out for their café excellence by the Bar d’Italia del Gambero Rosso (i.e., awarded 3 tazzine and 3 chicchi), Converso Bra is clearly one of them. It is a relatively small corner establishment near downtown Bra, and it can be easy to miss. It has turn-of-the-19th-century looks, but there is also covered outdoor seating along Via Cavour, across the street from the San Giovanni Decollato church, that help give its nearby location away. It is by no means a large space. A third of the storefront (entering from Via Serra) is dedicated to its excellent pastries and sweets. But in back there is a cozy mirrored coffee bar with several tables and dark wood. It’s a prime neighborhood location for a great caffè in the morning before work. And while the pastries are excellent, a word of warning: definitely eat with it wrapped in the treated paper napkins supplied on the tables. Touching the sticky-sweet surface of those things is like handling a mouse glue board. Using a three-group Leva 3 manual La San Marco, the barista (often a woman here) pulls espresso shots with a medium brown, even, full crema of good texture and thickness. It has a complex herbal flavor — cloves, etc. — that is quite unusual for Illy beans. There can be a slight sourness, not unpleasant, to the cup at times. Served in Illy logo IPA cups. A bit pricey at €1.20, but you’re paying for some of Italy’s finest. Read the review of Pasticceria Converso Bra. If you ever wondered the depths at which some people can profit from human stupidity, today’s San Francisco Chronicle underscored the point: What’s New: Fortified organic coffee. (Thanks, Cindy Lee, for spreading the unchecked stupidity.) Yes, that “healthy coffee” thing, where foolish lemmings leap off cliffs in blind faith and obedience over health claims made as a marketing strategy. Here the article tells us about how we now can get our coffee cut with mystical elements that bestow us with “Immunity,” “Clarity” and “Calm”. First off, to paraphrase Michael Pollan, never trust a food product that makes a health claim. And this stuff is oozing with them. Secondly, coffee has over five centuries of epidemiological evidence supporting its safe and healthy consumption by humans. That’s some 500 more years of evidence than you will get from any indiscriminate, unregulated “Immunity Boost” concoction jammed into your oh-so-healthy Jamba Juice. So what’s really healthy and unhealthy in this picture? Does anyone know what’s really in this “immunity” snake oil formula going around? It could contain Chinese-manufactured diethylene glycol for all we know. Even worse, places like Whole Foods sell this junk. My advice? I’m no doctor, but I play one on my blog. To avoid being a contestant for next year’s Darwin Awards, stick with the items your great-grandmother would recognize as food. Everything else is just playing toxic chemistry roulette under the marketing disguise of “health elixirs”. If it has to try that hard to convince you that it’s good for you, chances are that it isn’t. Our Espresso in Torino and Piemonte series returns to Alba, Italy. We really liked Caffè Calissano and wish we had an institution like it somewhere in SF. If it were here, its espresso would rank it in the top quartile of the city. But in Alba, comparatively, it served some of the “worst” espresso we had in town. Now doesn’t that speak volumes? Located on Alba’s main “Piazza Duomo” (and near the fabulous restaurant of the same name), this ornamental café carries grand café style. In addition to some outdoor seating under the porticos, there’s a sidewalk seating area entirely enclosed in glass — much like Piazza Duomo’s excellent sister trattoria, La Piola, next door. Inside there is a mirrored bar, dark wood lining everywhere, plenty of Italian café reading materials to choose from, and the necessary servings of gelato, pastries, etc. The Bar d’Italia di Gambero Rosso awarded it with 2 tazzine and 2 chicchi. It is arguably the most distinguished, traditional café in town. Using a four-group Rancilio and a Mazzer grinder, they pull espresso shots with a mottled medium-to-darker brown crema. It has a richer aroma, but a thinner body despite its modest serving size. With a lightly toasted flavor of spices. Their milk frothing consists of good microfoam, but it’s applied sparingly on milk-based drinks (something of an Italian cultural habit/expectation). Served in designer Mokafè IPA cups celebrating Italy’s Le Langhe and Il Roero regions. A bit pricey at €1.20. Read the review of Caffè Calissano. Formed by Piero Alciati (of Guido Ristorante Pollenzo, reviewed earlier this week) and various other food illuminaries in the region, Eataly is akin to SF’s Ferry Building Marketplace on crack and steroids. Inside Eataly is also the Guido per Eataly restaurant. To start, Eataly is massive — at about 120,000 square feet of food, restaurant, and food education space. There are sections dedicated to food from the oven (il forno: pizza & foccacia, etc. ), fish, vegetables, meats, pasta, cheese & salumi, gelato, wine, beer, etc. In addition to selling these artisanal food items, each section also has its own in-store “restaurant” featuring these foods. A second Eataly complex has just opened in Milan, with a smaller cousin soon to open in New York City. As with much of Piemonte, Slow Food is king here. And, as is the Italian way, any respectable public gathering space must have a good café nearby to gather at and partake in your recommended daily allowance of espresso. At Eataly, that café is called Caffè Carpano — named for the original vermouth factory on the premises. Caffè Carpano is located at the lower level, further towards the back. You enter past the roasting equipment and shelves of roasted coffee. The café features three dual-group Gaggia machines and a lot of Italians needing their espresso fix. They sell beans under the Hue Hue Café name, from Pausa Café, and their primary blend consists of 40% Guatemalan San Pedro Necta cru, 30% arabica, and 30% robusta. (Hue Hue, pronounced “way-way”, is short for Huehuetenango — a region, or department, of northwest Guatemala.) Other options, however, are possible (as shown in the coffee menu photo below). With their standard Hue Hue Café blend, they produce shots with a medium brown crema with textured speckling and a great, potent aroma. It has a pungent, herbal flavor. Naturally best served as a ristretto, and a mere €0.85. Read the review of Caffè Carpano.